THE BIG BANG THEORY’S Sheldon (Jim Parsons) tries to bond with his father-in-law (Teller) on Thursday’s episode, “The Consummation Deviation,” but he’s promptly derailed by, well, magical tricks. 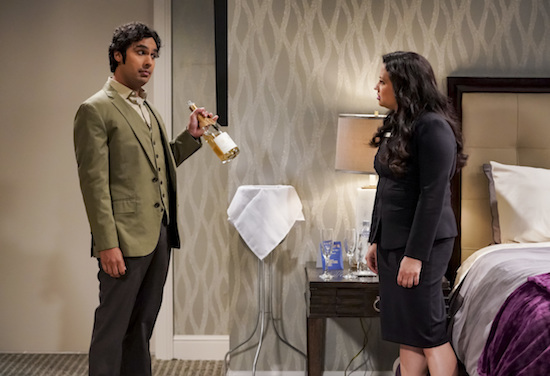 "The Consummation Deviation" - Pictured: Rajesh Koothrappali (Kunal Nayyar) and Anu (Rati Gupta). Sheldon tries to bond with Amy's father, but when Wolowitz lures Mr. Fowler (Teller) away with magic tricks, Sheldon has no choice but to bond with Mrs. Fowler (Kathy Bates). Also, Koothrappali and Anu try to get physical for the first time, on THE BIG BANG THEORY, Thursday, Nov. 8 (8:00-8:31 PM, ET/PT) on the CBS Television Network. Photo: Sonja Flemming/CBS ÃÂ©2018 CBS Broadcasting, Inc. All Rights Reserved.